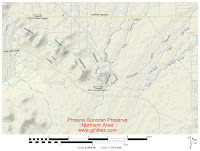 The Esplanade trail is in the northern area of the Sonoran Preserve in Phoenix, Arizona. It begins off of the Apache Wash Loop where it travels along Cave Creek Wash to the Carefree Highway where it meets up with the Cliff Walk trail. Various loops can be created by combining the Esplanade, Cliff Walk and Badger Brawl trails along with several short connectors. There is also the option to branch off on a trail that passes under the Carefree Highway along Cave Creek. The Esplanade trail begins off of the Apache Wash Loop near the 3/4 mile point from the Apache Wash trailhead. As the trail starts out it crosses a long, open, level area which is just what esplanade means in Spanish. The trail has a hard packed surface that is mostly smooth other than an occasional rock or two. As the trail begins traveling along the Cave Creek Wash all the plants become taller making the route more scenic and secluded. 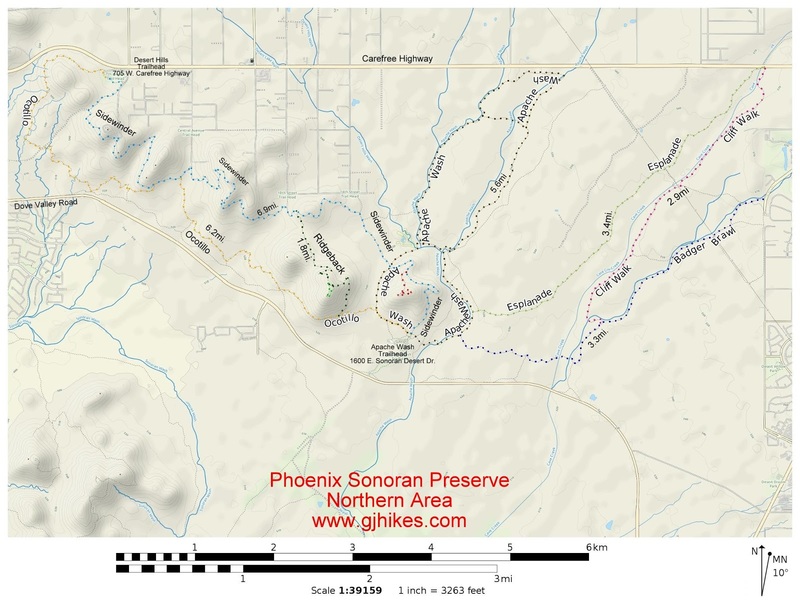 The trail markers in the Sonoran Preserve are spaced in quarter mile intervals with extra markers included at trail junctions and some of the other places of ambiguity. At the top of each label is the elevation profile for the trail with an indicator for the current location that shows its relative position from the two ends of the trail. Anyone that is also carrying a map should find it quite easy to keep themselves oriented. When the temperatures are no higher than the mid 80's even the desert can be an inviting place. As the Esplanade trail nears its end it reaches the Carefree Highway and crosses the Cave Creek Wash. There is another trail that branches off on the left that goes under the highway. Even though the trail goes along Cave Creek we can't say for sure whether that is its name. The sticker on the sign mentions the founding and incorporating dates of the Town of Cave Creek but doesn't actually say that this is the Cave Creek trail or something else. As the Esplanade trail comes up out of the wash it also comes to an end. From here you can continue to the right on the Cliff Walk trail which heads back in the other direction along the cliffs above Cave Creek. After 2.8 miles it meets up with the Badger Brawl trail and comes to an end. Making a loop out of the Esplanade and Cliff Walk trails will come out to right at 9 miles including the distances to and from the Apache Wash trailhead. A smaller loop can be made by using the connector trail. On the day that we took the photos for this post the Esplanade trail was getting quite a bit of use from mountain bikers as well as a few hikers and trail runners. If you would like to see it for yourself then all you have to do is grab your bike or 'Take a hike'.